The highlight of day three at the Punchestown Festival is the Champions Stayers’ Hurdle for which Penhill is 13/8 at BetVictor to follow up his fluent Cheltenham win. That is the best form on offer but it should be noted that he was beaten at this meeting 12 months ago having won at Cheltenham and it is possible that he is best fresh. Bacardys (5.30) was not suited by the way the race developed at Cheltenham but would have finished third had he not fallen at the last and he is taken to beat his stablemate. The selection won the Champion Novice (2m4f) at this meeting 12 months ago and gets on very well for Patrick Mullins. The selection is 9/2 at BetVictor and he can reward each way support. Footpad (6.40) cannot be opposed in the Grade 1 Novice Chase such was the ease of his Arkle success last month. The selection is ½ with BetVictor and for those who like short prices he looks to have outstanding claims. Petit Mouchoir was beaten 15l at Cheltenham before finishing runner up at Aintree and I wonder if this highly-strung grey will give his running given this is his third quick start. Stoneford (6.05) carried 11st 12lbs to success in a Cork Maiden at the beginning of the month over three miles and there is the possibility that he could have been let in lightly for his handicap debut this afternoon. A winner of a Fairyhouse Bumper he will carry just 10st this evening including Donal McInerney’s claim and he is another each way selection. Three Stars (4.15) ran a cracker in the Grand Annual at Cheltenham last time given he met trouble in running on more than one occasion and was still only beaten just over ten lengths. Sea Flanagan takes over this afternoon and if he gets a bit of luck in running, he must go close – although it is an ultra-competitive 24-runner handicap. At Perth, Lord Napier (5.10) lost a shoe at Ludlow last time but that was a very disappointing effort nonetheless and this is something of a retrieval mission. James Bowen takes off 3lbs and the handicapper has seen fit to drop him a couple of pounds. Ballyarthur (3.30) has only been raised 3lbs for beating War Sound at Uttoxeter last time, which seems more than fair. The selection has not looked the most natural over fences but he has the scope to make his mark over the larger obstacles and Nigel Twiston-Davies has a good record at this meeting. Philip Hobbs has, at the time of writing, saddled five winners from his last seven runners and his Awake At Midnight (2.45) is taken to appreciate the step up beyond the minimum trip for the first time at Warwick. One note of caution - the selection has never run left-handed over hurdles and failed to handle the bend running away from his stands’ at Haydock on his only start. 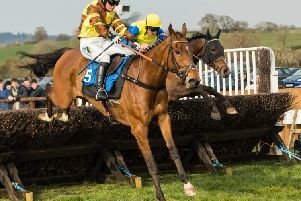 Sister Sibyl (3.20) did us a favour at Cheltenham last week in a mares’ contest where she bounced off the fast ground, but she had run well here over an additional half mile here on her penultimate start. The drop back to two miles certainly appeared to suit Hughie Morrison’s mare last time. This is a much better race and Tommy Silver is much better than he showed at Aintree last time when he was ill at ease on the soft ground. If the ground is genuinely good, he would be a big danger but Sister Sibyl suggested she was well ahead of her mark last week.